The Toro Wheel Horse 416-8 has been the best mower we have ever owned. From ease of use to functionality I believe it has most others beat hands down. The fuel system is designed to keep out most of the dirt and particles that tend to clog most fuel filters. If the filter does clog, which isn't very often, its location and design make it very easy to clean and reassemble. Although there are restrictions on the incline and decline that you are supposed to adhere to, I have never had a problem exceeding the limits. The gear shift in front is in a fairly usable position, however, it would probably be better located on the side of the vehicle. I have to keep moving my legs and looking down to shift gears. The blades (for which this lawn mower has three) all cut with uniform height. They are fairly simple to remove and sharpen. If something (like rope) becomes tangled or wrapped in the blades it is generally easy to remove. 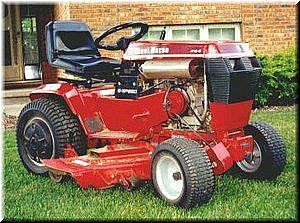 As far as safety features are concerned the Wheel Horse has a seat trigger that cuts off the blades should you get off the mower for any reason. Also, you are unable to engage the blades if you are not sitting on the mower. If I were to change one more thing on the mower it would be the handle that I use to raise an lower the deck. The long and narrow button on top of the handle is extremely difficult to depress and you have to apply considerable force to raise the deck up and lower it. This can be especially cumbersome if you attached a snow plow to the front of the machine for plowing during winter. I would definitely not recommend this particular machine for this purpose. Just bought a wheelhourse 4-16-8 with the ID # 3116k804 27905. Need an owners manuel. Would like to look for plow and other attachments. The manual lift must have been incorrectly set up. On the rock shaft there are three holes in which the lift chain can be placed. the holes progress from 1/2 inch away from rock shaft for maximum leverage out to about 2 inches for low leverage and high travel. I assume yours was installed in the outer most hole requiring herculean effort with a heavy deck. Had it been placed at the inner most position, you can lift a deck with two fingers. I have a two stage 44" snow blower that weighs 250 lbs. and it requires some effort, my 11 year old can lift it. I also have a 54" dozer blade that i have no problem handling, even after hours of plowing (I have a 1k ft driveway as well as a 200x75 parking area and a couple of large garages that are kept clear...about 4 hrs plowing give or take depending on the snow amount and type). Changing the drive belt on a WheelHorse is the easiest of any tractor I have owned...no climbing underneath. Simply remove four screws that hold the belt side cover to the tractor and remove cover, remove PTO pin so belt can be installed over the engine pulley. install belt over transmission pulley, fit under the clutch idler pulley, replace cover and PTO pin and your done. I can do it in ten minutes. I wish to reiterate the durability of these machines. the chassis, front axle, and transaxle are simply unbreakable. the Onan purrs like no other small engine and pulls/pushes with authority that belies the 16 hp rating. just a beautiful engine. I own about 30 tractors and nine are as well engineered as the classic WheelHorse tractors. The availability and interchangeability of attachments and the ease of installing them adds to the pleasant ownership experience. Others come very close, Case/Ingersoll is an excellent product line, Ariens, simplicity and Bolens are the standouts. I purchased a used 2005 Craftsman GT5000 to use as a mower and while a comfortable machine, i would not think it would hod up slamming a pile of gravel. The aluminum transmission was noisy under even moderate loads. Example, i tow my 18ft boat and my three place Ski-Doo STX supercharged up a moderate hill every year with my trusty old 79 WheelHorse C-121 (12 hp.) and it does so completely effortlessly with the heavy cast iron Eaton hydro. The Craftsman was unable to pull the boat. the transmission stalled (slipped, went into bypass) and made the most god awful noise. It was able to pull the jet ski but it was straining. So the 24 hp Kohler is useless if you cant use it. That 32 year old wheelhorse with 2k hours on it would pull that craftsman backwards without effort and its only 12 hp. that was the last time i purchased a newer machine...its really sad that a machine would cost upwards of 12k (Simplicity Legacy, John Deere 700 series) to compare to that old machine. And the 416...even better. Outstanding Product, Sad they stopped making these. These tractors, as well as WheelHorse in general, were truly designed to last ones lifetime. The Onan and Kohler K-Series engines will run for 3k hours vs. a Kohler Courage that is used in all the new stuff is lucky to see 300 hrs (the Kohler Command is an excellent engine and should see 2k hrs). There are tons of WheelHorse machines out there that are 40 yrs old and still going strong. I am a collector and possess 21 various WH tractors...I have never seen a WH transmission let go, they are solid cast iron with an 8 spindle differential and 1 1/4 inch axles...they dont break...never seen a frame fail, they are 1/4" thick cast iron full length C channel rails. The toys that are labeled "Garden Tractors" today are a joke in comparison. You would need to spend upwards of 10k to get something of similar build quality today...even the small BX Kabota's are not as heavily built. If one is in the market for a general duty tractor, they will be far far better off purchasing a 10 yr old well maintained WH for 3k vs anything new under 10k. It is sad what has happened to the market. I've owned this tractor which is a 1989 model year for 5 years now. I've added a 48" snow blade and 42" tall discharge snow blower. It is the best tractor I've owned period. I have 517 hours on the 16hp Onan engine and it runs perfect. I have kept the engine clean with compressed air, routine 30 wt. Rotella oil changes and filter changes. Recently picked up a 48" deck to go with the 42" rear discharge deck. Great tractor. I agree, the 416 is an excellent tractor. I bought mine in 97 and have cut two acres with it every summer since then. Bought a snow plow a few years ago, and it does a pretty good job shoving snow out of the driveway. (Except when you get two feet like we did a couple weeks ago). I keep it up well and the only things I've replaced is batteries, a couple of belts (wait til you have to replace the main drive belt). Overall, it has done a good job for me. My lift handle button depresses easilly and is all a matter of maintenance, you have to keep things lubed! I also would like the shifter on the fender but I overcame the issue by building a longer shifter to make it easier to use. I have had my tractor since 1989 and it's 2009 now with absolutely NO major problems! I couldn't ask for a better garden tractor!